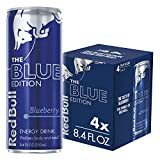 Red Bull Blue Edition is a berry flavored version of Red Bull Energy Drink. So our review of how this edition tastes here. 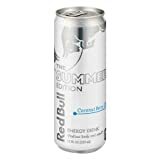 Carbonated Water, Sucrose, Glucose, Citric Acid, Taurine, Sodium Citrate, Magnesium Carbonate, Caffeine, Inositol, Niacinamide, Calcium Pantothenate, Pyridoxine HCl, Vitamin B12, Natural and Artificial Flavors, Colors, Blue 1. Sugar content: 27 grams (per 8.46 ounces). 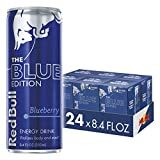 How Does Red Bull Blue Edition Compare? 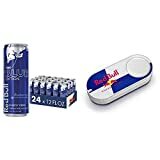 Red Bull Blue Edition contains 9.46 mgs of caffeine per fluid ounce (31.98mg/100 ml).